Formula E uses the ‘most unpredictable championship on the Planet’ as its tagline and with every passing ePrix, it delivers on this assertion. 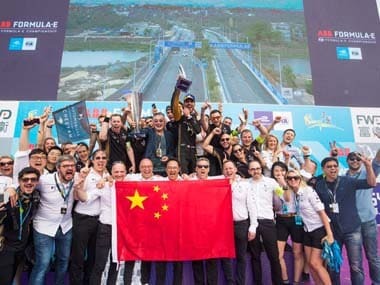 The 2019 Sanya ePrix in China was the sixth race of the 2018-19 Formula E season. Amazingly, each of the six races have seen a different pole sitter, race winner, racing winning team and the driver with the fastest lap of the race — basically, points have been distributed across several teams and drivers making the championship overall highly interesting and of course — unpredictable. That said, Formula E’s race results can also be classified as ‘before penalties’ and ‘after penalties’ — given how every race of the season has seen more than a handful of penalties alter race results and eventually, championship classifications. Like with other Motorsport series, the official results can take up to hours after the chequered flag has been waived — meaning that the drivers seen cheering in public might not be the eventual gainers. The official Formula E website displays the results of various sessions in a prudent manner — should they offer a filter that shows a ‘before penalty’ and ‘after penalty’ results too? The reigning Formula E Champion Jean-Eric Vergne scored his first victory of the season in Sanya. In fact, this victory in China would have definitely pleased his team Techeetah’s Chinese partner, DS Automobiles — after all, this was also the team’s first win of the season. Vergne’s win means that he successfully managed to break his point-scoring drought from the last three races. Likewise for Techeetah, who could manage only one points-scoring finish in the last three races. Oliver Rowland (Nissan e.dams), who missed chances to score big points in the last two races in Mexico and Hong Kong (thanks to battery issues), scored the first pole position of his Formula E career with a lap that was a hundredth of a second faster than Vergne’s. The Nissan driver made a bold claim in the days leading up to the Sanya ePrix. He said that he would be “silly” to consider racing in Formula 1 over Formula E! BMW’s Antonio Felix da Costa was third, ahead of arch-rivals Audi (Daniel Abt, 4th). The Super Pole session had drama of its own after the other Nissan e.dams driver and former Formula E champion Sebastian Buemi crashed out during his qualifying attempt, while Alexander Sims’ BMW suffered from gear selection issues. Techeetah’s other driver Andre Lotterer started just behind the Super Pole participants in 7th, ahead of the two Mahindra drivers (d’Ambrosio and Wehrlein) and the Audi of Lucas di Grassi. As with every race, qualifying pace was intense and the top-20 drivers were separated by only 1.2 seconds, with the Gary Paffett (HWA Race Lab) and Nelson Piquet Jr. (Jaguar Racing) further adrift in 21st and 22nd. In all, the competitive quotient of the grid and drivers is a big selling point of Formula E, with the eventual gainers being those who are able to run a sound race without committing too many mistakes and of course are lucky to not get caught up in others mistakes. The 45-minute long race was split into two parts thanks to a Red Flag that was brought out by BMW’s Sims after he clipped a barrier while in battle mode with Lotterer, bringing his car to a halt on the street circuit. In the first part of the race, it was Rowland that was chased and then successfully overtaken by Vergne for the lead of the race. However, in the second part, Rowland was unsuccessful in returning the favour to Vergne as he settled for 2nd place — the best finish of his relatively short, but impressive Formula E career. It was BMW driver da Costa, the winner of the opening round of the current season in Saudi Arabia, who claimed 3rd place ahead of the other Techeetah driver Andre Lotterer. Audi’s Daniel Abt crossed the line in 5th place — but the end to the race could have been far more eventful and dramatic had the final few minutes not be run under a ‘full course yellow’. First, Lucas di Grassi failed to activate his Attack Mode twice — he actually missed driving through the zone over two attempts. This saw Virgin Racing’s Robin Frijns overtake him for 7th place, in the first part of the race. However, in the final few minutes towards the end, a failed overtake/defence between Frijns-Buemi saw di Grassi be the unlucky loser while running in 6th place. The Brazilian driver was classified in 15th place, but walked away with zero points after scoring 2nd and 1st places in the last two races. For this collision, Buemi was handed a 10 second penalty — one that saw him be demoted to 8th place in the final classification. And of course, points were lost for Frijns too. In a first for Formula E, the winner of the last race in Hong Kong, Edoarda Mortara, was handed a 16 seconds post-race time penalty for failing to engage the Attack Mode twice — as mandated by the rules. The Venturi driver was classified 13th, bringing an unfortunate end to his three race points scoring spree. There were several other financial penalties — di Grassi was fined €5,000 for getting out of his car before it was deemed safe. Similarly, Abt (€1,000), Lotterer and Buemi (€2,000 each) were handed post-race penalties for speeding during the ‘full course yellow’ after the chequered flag was waved. Finally, Vergne was handed a reprimand for his behaviour under the Safety Car period — this means that the Frenchman now has 2 points on his license; a 3rd and final point will result in a penalty which we hope isn’t championship-impacting. The Indian-owned Formula E team is joint-first (but classified as second) in the Formula E Teams’ Championship. After a disastrous outing in Hong Kong (where the team scored no points with either car), d’Ambrosio and Wehrlein did well to score 6th and 7th place in Sanya. At 97 points, Mahindra Racing shares the lead with Virgin Racing who actually failed to add to their tally in Sanya — Bird had a collision with Vandoorne, while Frijns had his incident with Buemi. Audi and Techeetah, on 96 and 95 points respectively, are too close for comfort — basically, only 3 points separate the top-4 teams in the championship, with BMW in 5th — 15 points adrift. Even though neither Mahindra driver has appeared on the podium in any of the last 3 races, the closely fought championship will honour consistent performances from both drivers over a spike from either one. The case in point being Nissan’s performances. The former champions of Formula E (as Renault e.dams) have failed to score results consistent to the pace of their car and drivers — they lie 7th with less than half the points of the leading teams. In the Drivers’ Championship, Jean-Eric Vergne jumped from 11th to 3rd (54 points) after scoring his season’s first win — again, an indication of how tight the championship fight is and why scoring consistently is key to being in contention. This is exactly why di Grassi was upset at losing out on a 6th place finish and the 8 points that came with it. Had the Audi driver finished, his championship tally would be 60 points — 2 points behind current leader da Costa. 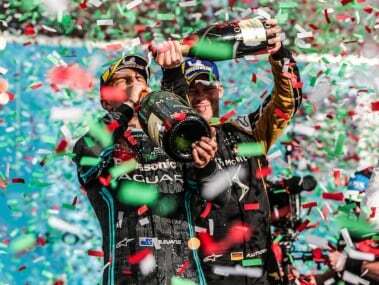 Likewise for Sam Bird, who was leading the championship till the Sanya ePrix. A no-score saw him drop from 1st to 4th! Strangely enough, the top-6 drivers (da Costa, d’Ambrosio, Vergne, Bird, di Grassi and Mortara) have all scored at least one race win while also having failed to score in at least one of the six races contested. BMW’s da Costa is the only driver to have stepped onto all the steps of the podium (1st in Saudi Arabia, 2nd in Mexico and 3rd in Sanya) while failing to score twice (Marrakesh and Santiago) — and he still leads the Drivers’ Championship. In the seven rounds that remain, victory, podiums and penalties could be anyone’s in the taking — but could Vergne make a late challenge to successfully defend his title? If he does so, he would be the first driver in the history of the series to have done so. Likewise for da Costa, could he score his first Drivers’ Championship in Formula E? 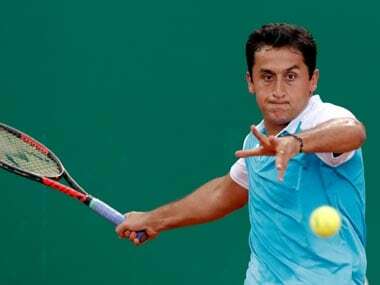 In the Teams’ Championship, can Mahindra claim top-honour after coming perilously close in the last few seasons? Also, would HWA Race Lab’s not-so-impressive performances impact Mercedes’ entry in the series next season? We shall soon find out!